Other Products: White acrylic paint, sandpaper, gold faux metal corners, natural wood frame, yellow cardstock, white cardstock, purple color pencils, Copic: V01, V12, V15, BV00, BV02, YG11, YG41, Clear Sparkle Nuvo, floral wire or leftover stamen wire. Instructions: Frame size: 7 1/2 x 5 1/2", it holds a 4 x 6" photo. Start with a natural wood color frame and paint it white with spray acrylic paint. Let it dry well then sand it to leave a distressed look. Spray paint 4 filigree corners made of metal or plastic (the ones here were plastic, gold that looked like metal). Glue the corners to the frame. 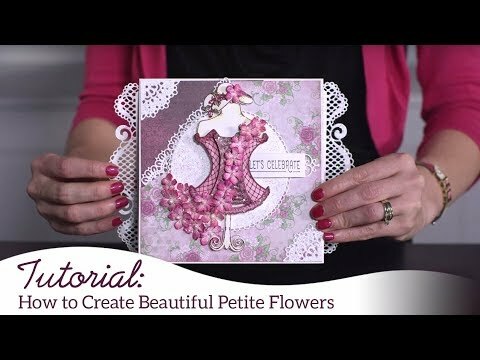 Stamp several small and medium sized pansies using Majestic Violet and Deep Purple. Stamp 1 large pansy with Deep Purple. Stamp 3 Delicate Pansy Spray using Leaf Green, sponge with Vivid Chartreuse. Sponge pansies with Buttercup and Deep Purple or Majestic Violet. I used a colored pencil to add the dark ring on each pansy. Die cut Sprays and Pansies then run Pansies through the die cutting machine in the shaping mold. 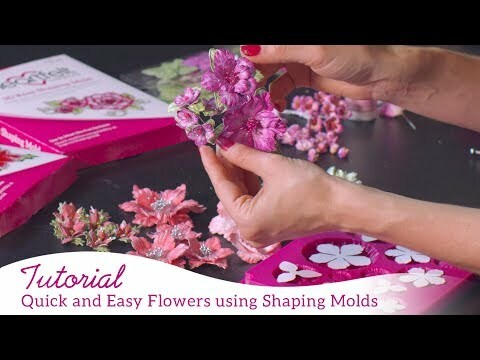 Stamp the Floral Fashionista blooms on yellow cardstock and run through with their shaping mold. Put pansies together and then add glitter to petals, also add glitter to the small flowers on the Pansy Sprays. Squeeze dots of Nuvo to the baby's breathe on the sprays. When dry add gold Prills to the centers. Add Prills to the centers of Floral Fashionista blooms. Cut the flourishes off the sprays and use them where needed including on the right top corner. Glue 1 spray (center part) in bottom left corner, glue flourishes up left side and right of the corner. Glue the large pansy in left corner and the rest of the pansies arranged up the left side, right bottom and 1 at the top right. Glue petite Floral Fashionista blossoms here and there. Dot glue onto frame and add white Prills to glue. Take wires from stamen (or other floral wire) color it green then curl it around a Groove Golf Tool to make spirals. Insert them wherever desired.